The Call to Arms content was part of the Europa Universalis IV sign-up campaign held prior to launch. Due to many requests from people who would also like to experience the content, it is now being offered as a DLC pack. 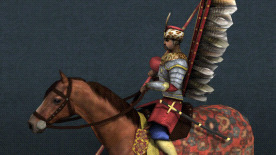 The Winged Hussars Unit Pack contains 12 unique cavalry models for the cavalry for Russia, Poland and Lithuania, three of the most influential eastern European states in the Europa Universalis IV era. The National Monuments adds new graphical national monuments to the already stunning Europa Universalis IV map. The new map items are: The Cologne Cathedral, The Notre Dame cathedral, The Tower of London, The Old Faithful geyser, The Kremlin, Saint Peters Cathedral, Mount Fuji and the temple Angkor Wat.